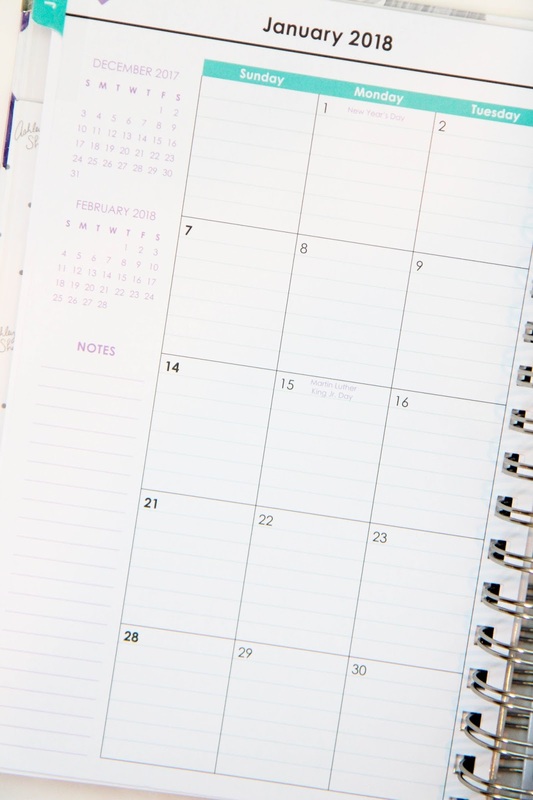 With October just around the corner, it's definitely time to start talking about 2018 planners. I'm already prepping for my "What Planner to Choose for 2018" series, but when this beauty landed on my doorstep it felt only right to give it its own feature on the site. 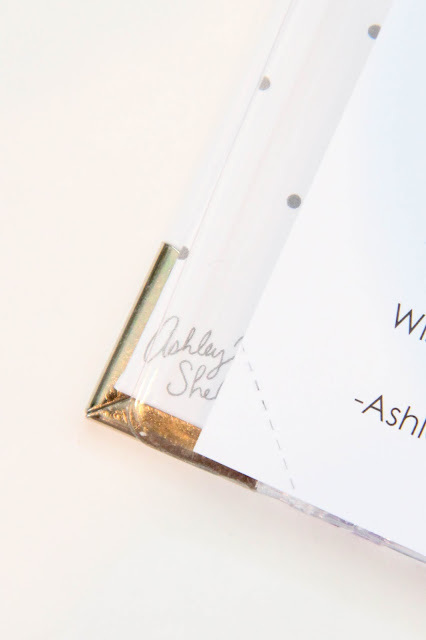 I've always loved the simplicity of the Ashley Shelly planner* while still having a ton of really clever, well thought out features. There are so many little details that really make this planner interesting. It's designed with working women in mind and there are a lot of elements throughout that reflect that inspiration. The thick, hard cover seems capable of standing up against a year's worth of wear and tear. The entire planner measures about 7.25x9.25 so it's a fairly standard size. On the inside cover there's a handy pocket to store papers and important documents. A pocket is a must for me in a planner. It's when you don't have one that you realize how often you need to tuck a small piece of paper somewhere so you don't lose it. There's also a sheet of icon stickers in the planner's color scheme. A nice touch, but I do wish they gave a bit more thought to the icon choices or created a more "fun" sheet. There's also a clear PVC pocket in the front that I somehow neglected to photograph. What a professional operation I'm running over here. The edges of the cover are reinforced with metal so they won't get dinged up easily over time. But my absolute favorite feature of Ashley Shelly planners is such a small detail. The corners are perforated so you can rip them off when you're done with a section. Every page has one so over the year you'll be able to quickly find your spot without the need of a bookmark. Clever. The planner has the standard features you begin to expect in agendas. 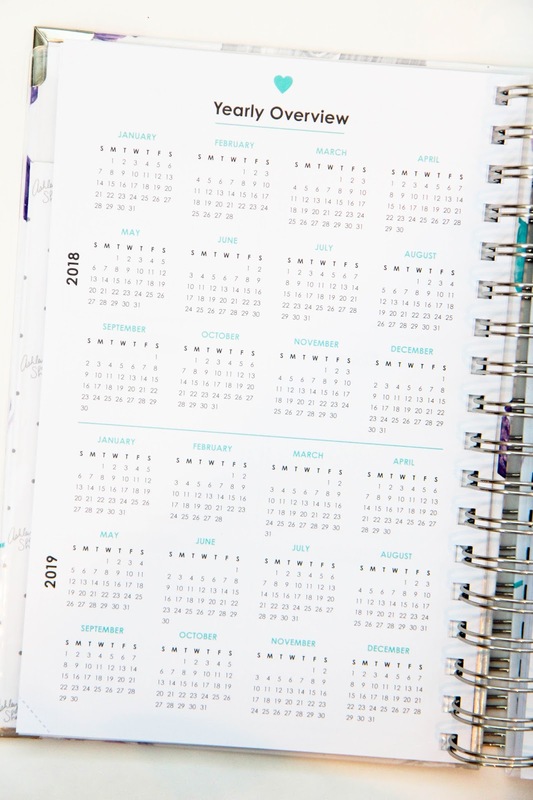 There's a yearly overview page so you can stare at how fast time is passing while trying to figure out the best day for a dentist appointment in a future you have no clue about. 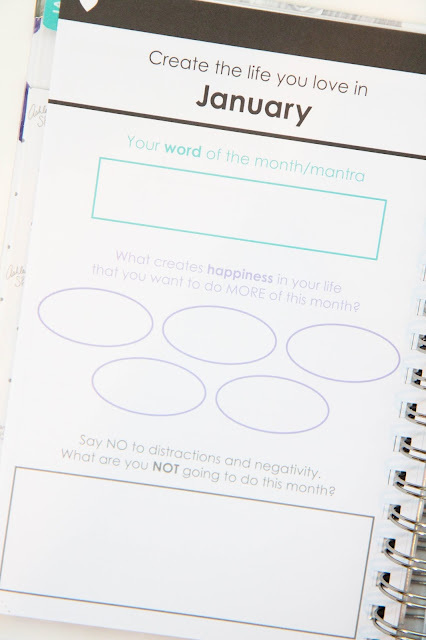 The monthly view is simple, but there are convenient lines to make jotting things down easy and fuss free. Before each weekly page is a motivational spread to help you reset your mind and gear up for the next month ahead. I love this addition because it makes the planner seem more personal and interested in the user (without being creepy). It reminds me a lot of the Erin Condren note pages while being more guided and exact. Although I love the freedom of the EC pages to do whatever I want, this helps to focus on certain areas without having to come up with them on my own. It's a hub of sorts for all the information you need for the month ahead. The weekly pages tie in the monthly word at the top of each page so you can keep it in mind as the month progresses. Each day there are eight slots for meetings and event information with a place to write in the time. The right side of each day has six to do list spots, a due today section, and a dinner section. I personally love the limited to do slots because it really makes you think about what's most important for the day without overloading yourself with random to do items. For a working gal planner, this layout makes a lot of sense. Plenty of room to jot down meetings and appointments with space for a few important items to get done. 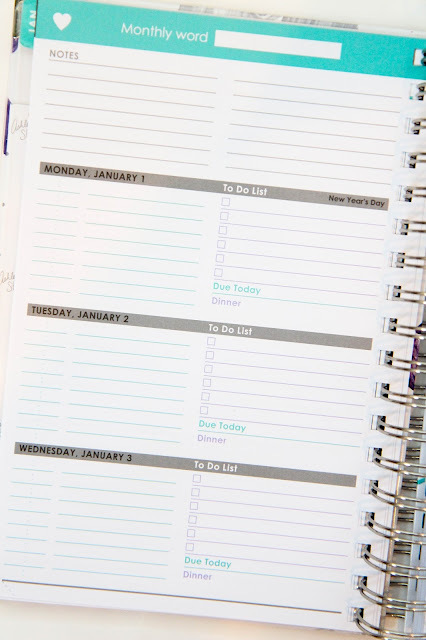 It's thoughtful without having unnecessary bells and whistles you just don't need in a work planner. My biggest concern with this planner has always been the price. It's $49.95 before shipping on the website and that leaves me a bit worried about just how simple it really is. Erin Condren planners start off in that range as well, but you can customize their covers and add more of a personal element. 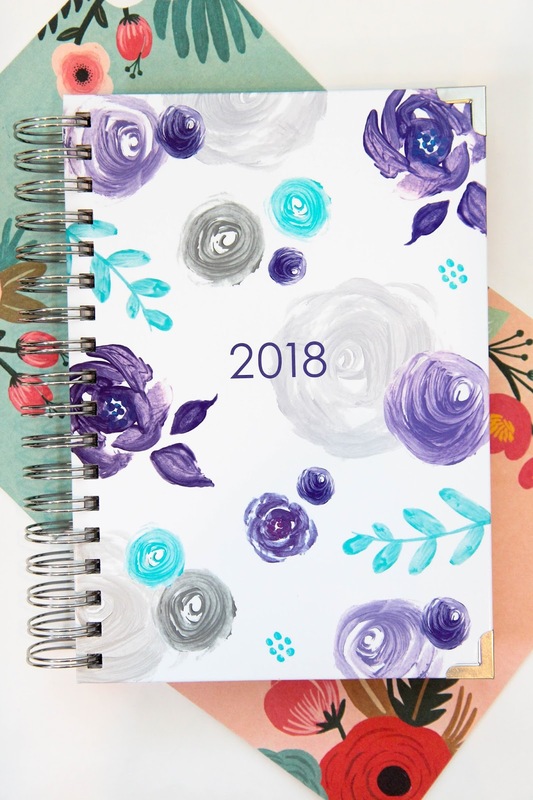 Although I really think this planner would work great for a lot of working women or people looking for a more simplistic planner, I don't think the price really matches up with the product. $30 seems much more reasonable. But I've been known to shell out my fair share of cash for planning supplies I know are just perfect for me. So if this planner is going to make you more organized with deadlines at work, it's definitely worth it. 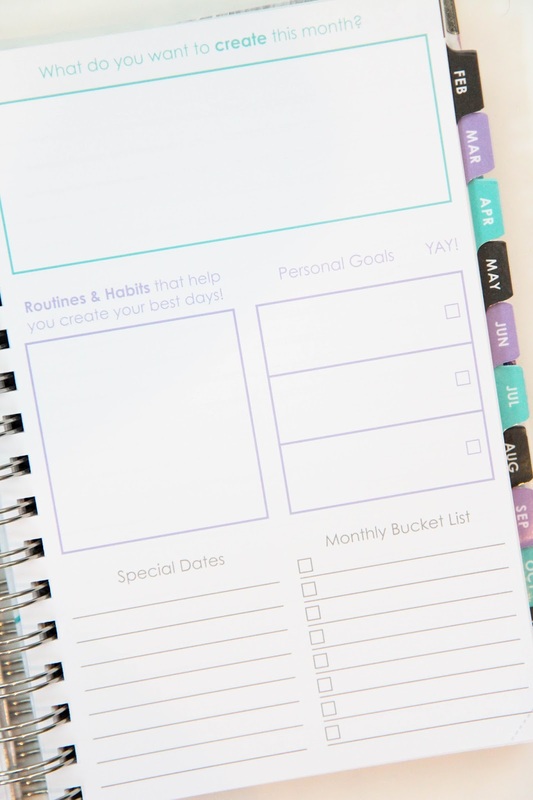 Planning is such a personal experience and I know countless working gals that this planner would suit immensely. 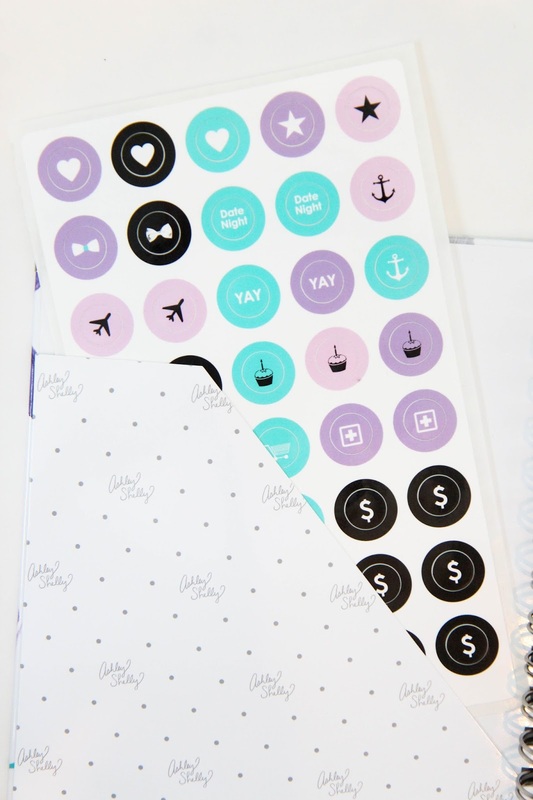 What do you think about the Ashley Shelly planners? Worth the price?